Job lot of Trix fibre track, and a box for some Trix points. 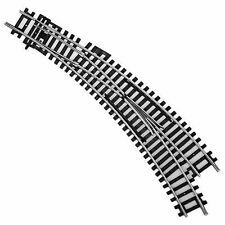 Lot consists of 12 x curves (enough for 1 circle), power track, uncoupling track, 2 x very short straights, 2 x short straights. The track is in fair condition, and would benefit from a light clean. Happy bidding. Trix Twin Track four points 442. Boxed. Two left hand and two right hand. There are also two short straights included. The box states 442 points hand operated 1 pair, so these is a double lot in this box. Also included is a 66596 bank of 4 switches which I believe is for working the points which I have not tested. Trix Junior Train | Twin Railway Set. TTR 609, 651, 634, 612. Our Branch covers Doncaster, Rotherham and District. 1 CROSS RAIL. 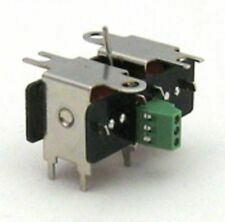 1 STRAIGHT WITH THREE HOLES (END SIDE BROKEN). I DO NOT KNOW A LOT ABOUT THIS TYPE OF ITEM BUT WILL DESCRIBE AS BEST I CAN. IN USED CONDITION AS PICTURED. 17 SMALL STRAIGHTS. 16 SMALL CURVES. Consists of 39 curves, 18 straights, 2 power feed straights,1 decoupling straight, 1 straight with buffer stop, 2 lever operated points LH & RH, 2 lever operated points with ground signal LH & RH. Points working. Point lever operates the point blades, see photos, but plastic lever housing is cracked. Total of 17 pieces. More antiques and collectibles up for sale every week! This is in a good working order in a play worn condition. TTR TRIX TWIN RAILWAY 3 RAIL 410/1. TTR Hand operated points (pair). If you would like to collect your item we are happy to accept cash on collection. New listingTTR Trix twin track- 20 x curves .7 x1/2 curves . 24x 1/4 straights. 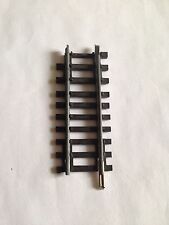 vintage 3 rail track oo gauge 2 points track 2410/1 round track 2 420/1 stright 1 420/1/4 short stright. Condition is Used. Dispatched with Royal Mail 2nd Class. (SIXTY) USED PIECES. (THREE RAIL RUNNING). RAILS WILL BENEFIT FROM A CLEAN. (THIRTY) 420/1 STANDARD STRAIGHTS. (TWENTY) 410/1 STANDARD CURVES. (TWO) LEFT-HAND MANUAL POINTS. Trix Twin Railway TTR Track - Straights, and Curves and Points. 14 x Straights. 20 x Curves. One of the curves has a piece missing out of the base (see pic). 2 x Points. TTR Permanent Way Formations. 6 x straights - all Bakelite bases C.1930s/40s. 12 x curves. Untested and surface is oxidized, so will need cleaning. VINTAGE TTR -TRIX TWIN RAILWAY POINTS. Will be listing lots more Trix Twin over the coming weeks. Attic find. I made a big loop from it. needs a clean but most of the pieces fit together, a couple dont. one bit is to connect a power source. 11 straights and 20 corners pieces. We use recycled products where we can. REST OF THE WORLD £11.80. ITEM IS UN-BOXED. TRIX TWIN OO GAUGE TRACK X 3 STRAIGHTS, I have three boxes of track and engines whivh I’ll be listing over the coming weeks. NO BROKEN PLASTIC AND CONNECT TOGETHER WELL. HAVE BEEN IN THE LOFT FOR MANY YEARS SO WILL NEED A CLEAN. TTR Straight rails. 6 x straights with Bakelite bases. If you would like to collect your item we are happy to accept cash on collection. These do work when the lever is operated. As you can see from photos they could do with a clean as surface rust is present. 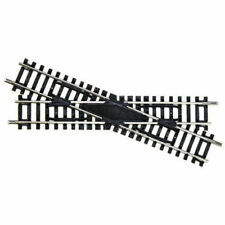 2 straights, 1 curve and 1 uncoupling rail which works correctly. Vintage Trix Twin Railway. 6 x Curved Track on Bakelite Base.